This theme is just amazing, lot of possibilities and it's very well crafted. Good fast support and very nice portfolio design. Hope, some will be added with next updates, like - dropcaps, maybe dynamic gradient backgrounds. But still, great job guys! Thank you! Great theme overall. Fantastic designs and very customizable. Documentation could be expanded. So far so good. I have no previous experience regarding Wordpress Themes, but I seem to be finding my way. 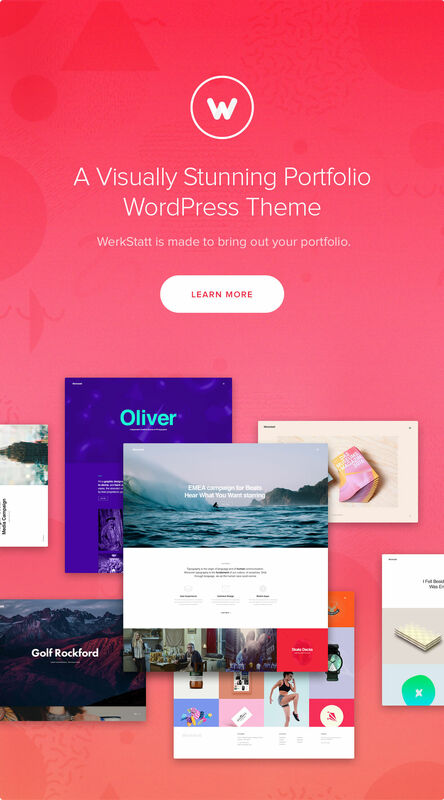 Werstatt's creative portfolio will give me the nice design I was looking for for my website. I made a good choice. Great theme, great customization features and perfect support ! Updates, Updates & Updates. But not just fixes and compatibility adjustments: Real new stuff. Like templates, Features and more. Excited to see what the next update will bring. Hi. I have a long names in the menu, words are not transferred to another line and some words are not visible. 1 – link the image on the main slider to other page; 2 – post a video on the portfolio before text and images. I’m looking for your answer to buy it. Thanks! Hello, I have a problem with the header. When you skip header style2 menu_style1 hover is not attached to the top, you see the site that scrolls under the menu bar. How can I fix it? Hello, any idea how we can get the author’s prompt response to a support ticket? It’s been days now. It’s what I dreamed about a few years ago when I wanted to have a website. I own a site now that comes from my dreams. It feels unreal and it is a gift. I wish I could shake hands with the creators. Thanks for the good taste and guidance. You grow in my heart through joy. I know this is a long shot, but do you have an html version of this theme? Hi, Where can I change the text (and button) color of the portfolio slide? Also where can I change the text ‘view more’ on the button? I love you theme is so customizable! I sadly was messing up with the typography setting and changed the original font of the theme. I know is a dumb question, but what’s the name of the font? so that I can change it back. What a nice design theme, i would like to purchase but have some purchase questions. 1.Demo site are running on VPS, with CDN as to cached? 2.I notice that the demo site is running extremely slow in test results? 3. What are the recommendation for hosting/server requirements for optimal performance for this theme?